Brussels member Emily Waterfield reports on the talks given by Professors Angus Easson and Sandro Jung at our 4th annual Brontë weekend in Brussels. For a report on all the activities over the weekend see the following post by Selina Busch. The weekend was attended by several members from the UK, including Sally McDonald who chairs the Brontë Society's membership committee. When her Life of Charlotte Brontë was published in 1857, Elizabeth Gaskell said she would never write another biography. The celebrated social and Unitarian novelist had, in addition to the emotional challenge of writing about her recently deceased friend, faced so many complaints and threats of legal action over the Life that it had to be rewritten for republication almost immediately. On the bicentenary of Gaskell’s birth, editor of the Oxford Classics edition of the Life, Professor Angus Easson spoke to the Brussels Brontë Group about the role of the Group’s home town in Gaskell’s research, and the problems caused by reporting on the Brussels years. Having accepted the invitation from Patrick Brontë to write the life of his daughter Gaskell was keen to bring the same “charm of locality and sense of detail” to the Life that had already characterised her novels Mary Barton, Cranford and North & South. She quickly realised that a visit to Brussels was needed. Like Professor Easson himself, she visited the cathedral, Royal Park and Belliard steps that feature in the novel, as well as many key Villette locations since destroyed. Gaskell’s investigations were however made more delicate by the fact that when Villette was translated into French, the fictitious city name was changed to ‘Bruxelles’. Individuals portrayed in the novel were thus left with even less to mask their identity and felt understandably wary of welcoming a second English novelist into their homes. Undaunted, French-speaking Gaskell made contact with locals including the widow of the former English chaplain and the Brussels chief of police. Although failing to win an audience with Madame Heger (the inspiration for the almost certainly slanderous character of Madame Beck), Gaskell was able to meet with Charlotte’s beloved Monsieur Heger (Monsieur Paul). Her careful investigations were not however enough to stop debate around the accuracy of the final book: a debate which continues today. Speaking to the Brussels Group later the same day Professor Sandro Jung considered Villette and investigations of a different sort. His talk on ‘Curiosity in Villette’ described Lucy Snow as “an emotionally motivated detective”, using curiosity to understand the world. In contrast, Madame Beck is a “cold, spying, curious female” with no emotional attachment to what she sees. A third “female gaze” in the novel is supplied by Miss Marchmont who, following the death of her lover, sees the world from a negatively emotional perspective. This contrasts with Lucy’s growth towards successful human relationships and reciprocated love. These various ways in which the female sees have been neglected even by feminists in critiques of Villette, which have instead focused on the male gaze and how females are seen, said Professor Jung. His full book manuscript on ‘Brontës and Curiosity’ will be published by Associated University Presses in 2011. 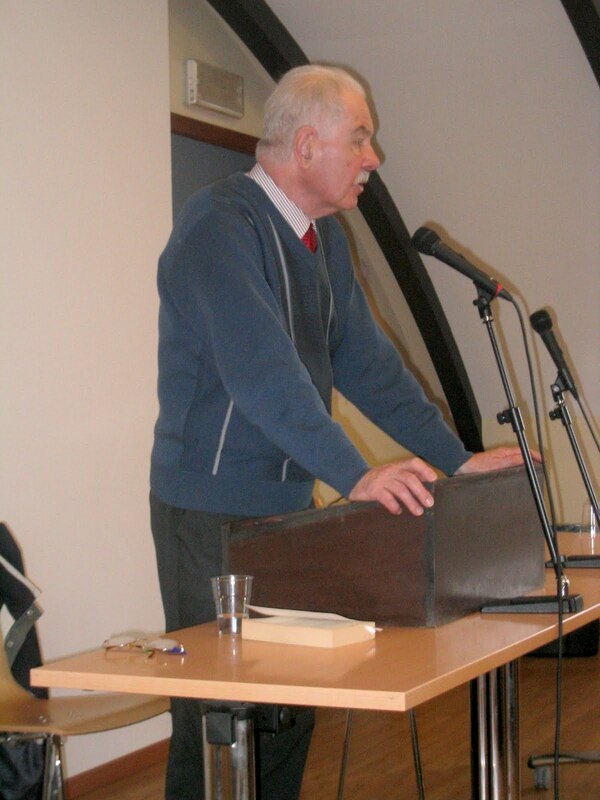 Professor Easson has taught at the universities of Newcastle upon Tyne, London (The Royal Holloway College) and Salford, where he was professor of English until his retirement in 2000. He has published widely on Romantic and Victorian literature, and is currently working on supplements to the Pilgrim Edition of the Letters of Charles Dickens and a book on Gerard Manley Hopkins. Professor Sandro Jung taught in the UK for ten years at the University of Wales Lampeter and the University of Salford. He moved to Ghent University at the beginning of 2010 to take up the University Chair in Early Modern British literature. Professor Jung sits on the editorial board of Brontë Studies. He is in the process of organizing a workshop on the poetry of the Brontës at Ghent University. There are always good reasons to return to Brussels and one reason, which could also be used as the theme of this weekend, is curiosity. 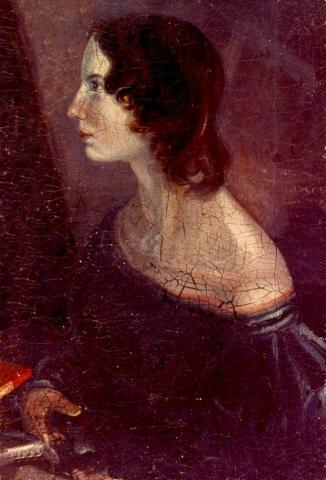 Curiosity led Mrs. Gaskell to Brussels to do research for her biography on Charlotte Brontë, a story that would be unravelled during one lecture this weekend and curiosity, or observation, was a theme of another lecture on Villette. For myself, I’m always curious to see Brussels again, even though I’ve visited the city many times before. 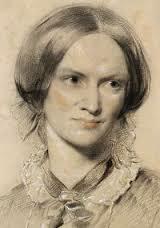 And despite some nerves and apprehension, I was looking forward to coming to the Brussels Brontë Group April weekend. I was curious too to find out what remained the same or had changed, whether I would see familiar faces again, or meet new people. It is always a journey of discoveries, however small or big. The start of the weekend, Friday 23rd, promised to be a wonderful first discovery. Last year I met an artist on our Friday evening get-together, Franklin, who told me about his work. I was totally fascinated and curious to see the real thing and on Friday afternoon I finally got the chance to visit his studio, in the company of a small group of equally curious BBG members. In an old house in the Chaussée de Waterloo, in the suburb of Elsene, we were warmly welcomed by Franklin who showed us up to his truly artistic and atmospheric studio, which he called a ‘Temple’. All I knew was that his work was inspired by the Brontës and their works, but none of our party was prepared for what we were about to see, including myself. The studio, or exhibition space, was in itself an ‘Experience’ with special music and lighting accompanying a mood to wrap around the works. I was in awe and totally transfixed by it all, most of all the magnificent works themselves, which seemed to come from another world. It is impossible to start explaining them, which I won’t attempt here, but I’m glad that the Brontë Society has given this clearly gifted artist the chance to exhibit his unique work in Haworth next year. So keep your eyes and ears open! Friday evening saw the official start of our weekend with what is usually a relaxed get-together to welcome old and new members, travelling long distances in some cases. For a few years now, one of the lecture rooms of the University of Saint-Louis has been put at our disposal, for which we have been and will remain truly grateful. A lovely varied buffet was spread out on some tables, with each of us bringing a little something to share with everyone, together with drinks provided by the university. Quickly the room started to fill with old and new faces, some of which I have got to know since I joined the group. Others I had met before in England, as it was lovely to discover a few Brontë Society members from the UK who had joined us for this weekend. It was also a privilege and joy to have Sally MacDonald joining us this weekend, who is the Chair of the Membership Committee of the Brontë Society. Yet it is always lovely to meet some new people on one of these informal occasions, and I suppose curiosity in each of us sets us off talking to others, exchanging ideas and discovering each other's interests concerning the Brontës. A small interlude of entertainment, in the form of a Brontë quiz livened things up even further and it was a shame that time flew by so quickly with the evening ending in good spirits. Saturday has become the most official and academic day of our yearly April weekend, and this Saturday 24th April, two lectures were on our programme which I was looking forward to very much. In the morning, Professor Angus Easson gave a lecture called On the Brussels trail: Elizabeth and The Life of Charlotte Brontë. In his open address, where the audience was invited to interrupt and participate, he talked about the questions and research involved for a writer establishing facts for a biography. How did Mrs. Gaskell manage to give a ‘truthful’ account of Charlotte Brontë’s life while trying to get co-operation from those still living? How did she go about gathering stories and material and visiting places and meeting people? Her detective work was one of persistence and curiosity in which she had a nose for the smallest details. I was interested to hear of her coming to Brussels and even managing to speak to M. Heger while he still lived in the pensionnat. Prof. Easson’s very interesting talk was followed by a lively debate with questions from the audience; perhaps a tad more lively then expected by many (those who were present will remember this). We then had a break for lunch at the Comic Strip Museum restaurant. In the afternoon we welcomed our next speaker, Dr Sandro Jung of Ghent University. This was a change in the schedule, for originally a meeting with author Jude Morgan was planned; he had to cancel and Dr Jung was luckily able to step into the breach only a few days before our weekend. Thank goodness! And we couldn’t have been more fortunate, for his lecture about Villette tied in well with Prof. Easson’s address that morning. His lecture, Curiosity in Villette, explored the theme of curiosity, observation, investigation and gaze in Charlotte’s novel. In his argument these ‘detective’ forms are used to project the different emotional perspectives of the main female characters in the novel. He explained that each character used this as an instrument for understanding (or even using) the world around them, all on a different kind of level. Unfortunately, as we came to the end of our afternoon, there wasn’t that much time left to get an audience feed-back, but all the interesting views and points left us with more than enough to think about. I find that no matter how often you hear new points of views in lectures you might either agree or disagree with, you’re always left with some new insight which enhances your understanding of the novel(s). Thanks to these wonderful two speakers, this eventful and mind-boggling day will no doubt have a lasting impact on many of us; I certainly wouldn’t have wanted to miss them. Last, but not least, we also paid special thanks to Isabelle Peere for all her efforts in making this weekend possible. Our two speakers kindly agreed to join a few of us when we agreed to go to the Grand Place for a well-deserved drink. As we stepped outside the university building, it appeared Brussels was bathing in warm sunshine when we walked towards the centre of the old town, meeting large crowds of tourists and shoppers that busy Saturday afternoon along the way. A nice coincidence happened; when we were sitting in one of the old cafés in the Grand Place, we heard instruments playing outside and two giant puppets (called Jan and Jannika?) appeared. An authentic, old Brussels folkloric scene took place. This was a scene from Prof. Easson’s talk that morning when he mentioned Mrs Gaskell’s sharp observation of old Brussels history and which she later wrote in her biography. After some farewells and goodbyes it was off to the Rue Teracken, as I always feel obliged to simply walk in that old, original street during each visit to Brussels, and say hello to the old quarter of which so little remains. I was also curious to see if the plaque at the end of that street was still up. It was…luckily! But oh dear, the street itself had lost its original stone paving. To my sadness I would no longer be able to touch and feel the old cobbles which I believed Charlotte and Emily might once have walked on. It was, I saw, paved with new cobbles and grey strips of hard stone. 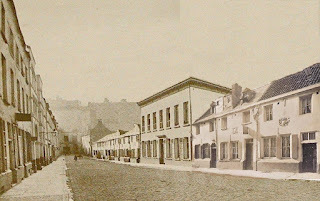 From the few places and streets still remaining and which belonged to the old Isabelle quarter, even the Rue Terarcken had not been spared the consequences of a make-over. On our last day, Sunday 25th, a guided walk around Brontë places was led by Myriam Campinaire in the morning. I personally didn’t go on that, as I’ve been before, but for those who went and hadn’t been familiar with the old streets, it certainly was an eye-opener. Around noon we all met up for lunch on the roof terrace restaurant of the Museum of Musical Instruments with its fabulous views of Brussels, where we enjoyed some good food, a glass of beer or wine, and more enjoyable conversations. For those interested we crossed over the square to the quieter garden of the Belle Vue, where we continued our conversations and discussions in what was a well-attended meeting, chaired by Helen. Now we have become a considerably bigger group in a short space of time, it was a good idea to take stock and discuss what ideas we had for the future. There is a lot of work involved in organising events, so it was nice to get a positive feedback from those willing to offer their help. Sadly, at the end of our meeting it was time go home and say our farewells to members and friends. It was time to take my train back to the Netherlands. I must say, I had a wonderful weekend to look back on, my curiosity rewarded, my energies replenished and lovely people I spoke to. I will hopefully see many again in a month’s time or so, when we will have the chance to meet in Haworth, during the Brontë Society’s AGM.